Adamantan-containing glutamate antagonist IEM-1913, 1-amino-4- (1-adamantanamino)butane dihydrochloride, has antiparkinson activity similar to memantine, but exceeds memantine in the anticonvulsant, antidepressive and the analgesic activity, and also unlike memantine is less toxic and more safe for application. IEM-1913 cause reliable pharmacological effects in a wide range of doses of 0.03-1 mg/kg whereas the memantine is effective only in a narrow range of doses, 15- 20 mg/kg. High pharmacological activity and relatively weak toxicity IEM- 1913 is due to the fact that bis-cationic glutamate antagonist IEM-1913 unlike monocationic selective NMDA-antagonist memantine causes the combined block of NMDA and the AMPA receptors of brain. Memantine is the single glutamate antagonist approved for the treatment of Alzheimer's disease. The basis of Alzheimer's disease is the toxic effect of glutamate on NMDA and AMPA receptors in the brain . A serious disadvantage of memantine, that blocks only N/MDA receptors in the brain, is insufficiently high therapeutic activity, which requires its use in the highest possible dose of 20-30 mg, causing sleep, dizziness, motor discoordination, aggressiveness, joint pain, hyper locomotion, memory disorder, headache, anxiety and in some cases psychosis [2-4]. Despite the high efficacy of memantine in doses of 10-20 mg/kg on models of parkinsonism, depression, epilepsy, and pain in rats, it did not receive the application in the treatment of these diseases in humans, as it requires very large doses of 100-200 mg, 5-10 times exceeding the permitted dose of memantine [2,3,5]. We synthesized compound IEM-1913, which equally blocks NMDA and AMPA receptors in experiments on brain slices. The chemical structure of IEM-1913 has some similarities with memantine because, like memantine, contains adamantyl radical. The difference lies in the fact that IEM-1913 contains second amino group and tetra methylene chain between the nitrogen’s, that is bis-cationic structure, while memantine- monocationic molecule (Figures 1 and 2). We carried out a comparative study of anticonvulsant, anti-parkinsonian, analgesic and antidepressant activity, as well as the acute toxicity and safety of mixed antagonist of AMPA and NMDA receptors IEM-1913 compared with the standard NMDA antagonist memantine. Anticonvulsant effects of substances were investigated in the model of pentylenetetrazol (PTZ)-induced seizures (PTZ 80 mg/kg, i. m.) in rats. Antidepressant action of the substances tested in the two-day Porsolt swim test in rats. Analgesic effect of substances was estimated by increasing latency of tail withdrawal in the tail-lick test in rats. To assess the acute toxicity and safety of IEM-1913 and memantine calculated dose of substance that causes the death of 50% of mice (LD50) and therapeutic index (TI): LD50/ED50-the ratio of toxic dose that causes the death of 50% of mice (LD50) to dose eliminating clonic-tonic PTZ seizures 50% of the rats (ED50) (Table 1). *Pentetrazole, 80 mg/kg, i. m., the severity of seizures on a scale of 0-6 scores. **The duration of immobilization on the grid (sec) 60 min after the haloperidol administration in a dose of 1 mg/kg. ***Duration immobilization (sec) for 5 min of repeated swimming in Porsolt test. 1ÃÂ < 0.05 in compared with the control. 2ÃÂ < 0.01 in compared with the control. Table 1: Anticonvulsant, antidepressant and antiparkinsonian action of IEM-1913 and memantine. As shown in Tables 1 and 2, the IEM-1913 has equal antiparkinsonian and analgesic activity with memantine in model of haloperidol catalepsy and the tail-flick test, but in 1.4-1.8 times exceeds anticonvulsant and antidepressant activity of memantine on model of PTZ seizures and test Porsolt in rats. Importantly, the above-mentioned pharmacological effects after i. m. administration IEM-1913 develop at doses 50-500 times less than after i. m. administration of memantine. *The minimum effective dose of the substance causing the maximum analgesia in the tail-flick test in rats (latency of the tail withdrawal more than 30 seconds). **The toxic dose of a substance that causes the death 50% of the mice (LD50). ***ED50-the minimum effective dose of the substance, eliminating generalized PTZ seizures in 50% of rats. ****In brackets: The ratio LD50/ED50. For calculation of TI use the results of experiments in the test of PTZ seizures in rats and in the test of acute toxicity in mice. Table 2: The analgesic activity, acute toxicity and the therapeutic index of IEM-1913 and memantine. Memantine has a low therapeutic index equal to 7.9 which indicates low safety of memantine (Table 2). At the same time, the IEM-1913 has a very high therapeutic index equal to 6430 (Table 2). 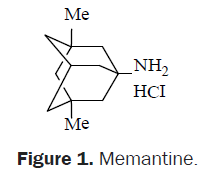 Thus, IEM-1913 has a therapeutic index in 814 times higher than that of memantine, and therefore, unlike the memantine is a compound substantially non-toxic and safe for use. IEM-1913 causes reliable pharmacological effects in a wide dose range 0.03-1 mg/kg, while memantine is effective only in a narrow range of doses 10-20 mg/kg. The relatively low therapeutic activity and narrow therapeutic window of memantine is related with the selective block only one NMDA subtype of glutamate receptors in the brain, eliminating only part of the toxic effects of glutamate. At the same time, the toxic effect glutamate on the AMPA receptors in the brain under the action of memantine compensatory even is enhanced, and this leads to a weakening of the therapeutic efficacy (Should be blocked both types of glutamate receptor) and increase in side effects of high doses of memantine [6,7]. It can be assumed that the high of antiparkinsonian, analgesic, antidepressant and anticonvulsant activity and low toxicity IEM-1913 is due to the combined block NMDA and AMPA receptors in the brain that contributes to a more effective elimination of the toxic effects of glutamate. Yang Z, Zhou X, Zhang Q. Effectiveness and safety of memantine treatment for Alzheimer's disease. J Alzheimers Dis. 2013;36:445-458. Rammes G, Danysz W, Parsons CG. Pharmacodynamics of Memantine: An Update. Current Neuropharmacology. 2008;6:55-578. Gmiro VE, Serdyuk SE. Comparative study of the NMDA-blocking activity and safety of mono- and bis-cationic compounds in animals. Eksp Klin Farmakol. 2000;63:3-8. Ikonomidou C, Stefovska V, Turski L. Neuronal death enhanced by N-methyl-D-aspartate antagonists. Proc Natl Acad Sci. 2000;97:12885-12890. Parsons CG, Quack G, Bresink I, Baran L, E Przegalinski, et al. Comparison of the potency, kinetics and voltage-dependency of a series of uncompetitive NMDA receptor antagonists in vitro with anticonvulsive and motor impairment activity in vivo. Neuropharmacology. 1995;34:1239-1258. Gmiro VE, Serdyuk SE. Combined blockade of AMPA and NMDA receptors in the brain of rats prevents pentylenetetrazole-induced clonic and tonic-clonic seizures without ataxia. Bull Exp Biol Med. 2008;145:728-730. Gmiro VE, Serdyuk SE, Veselkina OS. Comparison of Pharmacological Potency and Safety of Glutamate Blocker IEM-1913 and Memantine. Bull Exp Biol Med. 2015;160:68-71.